INSIDE Public Accounting (IPA), a leading accounting industry publication in the United States, has recently published it's report for 2018. We are excited to announce that seven TAG Alliances members have been recognized by IPA as Top 400 firms in the United States. The annual IPA rankings are among the longest-running, most accurate and up-to-date for the nation’s largest accounting firms. Beginning in 1994, INSIDE Public Accounting’s Survey and Analysis of Firms and the resulting national benchmarking report on the nation’s largest accounting firms has served as a barometer of the overall health, challenges and opportunities of the profession. The IPA survey and benchmarking report is the gold standard within the profession. Annually more than 500 accounting firms across the North America complete the in-depth financial and operational survey. The data is then used to compile the annual ranking of the nation’s largest accounting firms, which is unveiled in August of each year. IPA also conducts International benchmarking surveys for the top International associations, that provides the trends of the profession globally. For more than 25 years, trends are uncovered, new firms grace the pages of the IPA newsletter, growth and profitability metrics are highlighted and much more. The annual IPA rankings are among the longest-running, most accurate and up-to-date for the nation’s largest accounting firms. 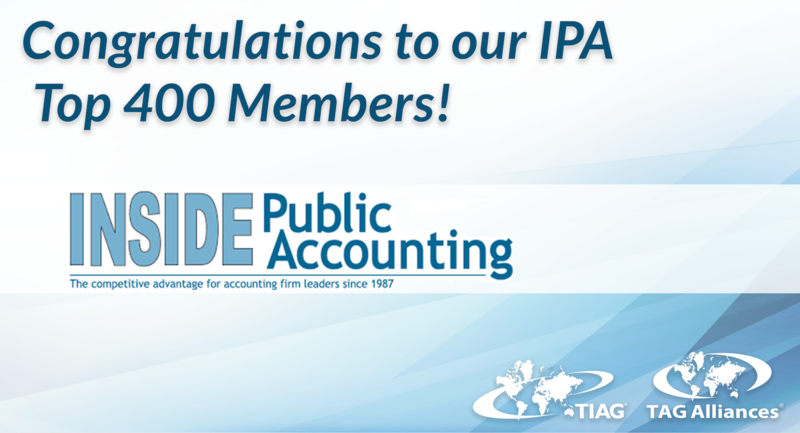 Learn more at www.insidepublicaccounting.com. Suite 300 - 1055 West Hastings St.
TAG Alliances® is a Worldwide, Multidisciplinary Alliance of Independent Members.